The Rapeneau family, owners of Ch. de Bligny. 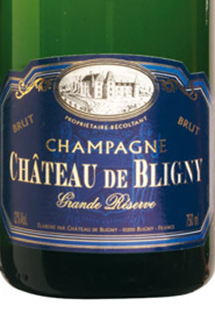 The estate vineyards of Chateau de Bligny in the Cote de Bar in the southern part of Champagne. A blend of 50% Pinot Noir and 50% Chardonnay, 100% estate bottled & produced from their vineyards in the Cote des Bar. dosed to 1% residual sugar. Straw-colored and fully sparkling; dry, medium-bodied with freshly acidity; scant phenolics. Clean, fresh and focused with citrus and some tree fruit and more mineral than toast but the toast is present and accounted for. Very much in the stylistic middle of Champagne. Evolves nicely in the glass. BearScore: 91.